BETHLEHEM, PA – It’s been a whirlwind of an offseason for new Lehigh head football coach Tom Gilmore. For Gilmore, hired in early January after a lengthy coaching search following the retirement of former Lehigh head coach Andy Coen, it was a welcome step back into the whirlwind of football coaching. That’s because midway through the 2017 season, Gilmore was fired at Holy Cross, a move that could have been something that ended his football career but instead appears to have brought his fire to a Lehigh football program that has seemed to truly need some sort of spark. Gilmore’s fourteen year tenure at Holy Cross ended in probably the most bizarre fashion imaginable. In the beginning of the 2017 season, Holy Cross led FBS UConn for three quarters after falling late, 27-10. Two week later, the Crusaders blew the lid off of perennial CAA power New Hampshire 51-36, setting their record at 2-1. With 5th year senior QB Peter Pujals, who would end up on the New York Giants’ practice squad and would ultmately play for the Atlanta Legends in the AAF, the Crusaders were seen, early on, as a real contender for the Patriot League title. But Holy Cross would go from a very impressive 2-1 start to 0-3 against Dartmouth, Lafayette and Yale that led to athletic director Nathan Pine, who has since left Worcester for Air Force, to terminate Gilmore’s contract during the Crusaders’ bye week. During the press conference announcing Gilmore’s hiring at Lehigh, questions surrounding what had happened in 2017 were unavoidable. But as ever, Gilmore handled the questions with class and exuded that not only had he learned from the experience, the whole incident was now in the past. Once he left Holy Cross, Gilmore joined the staff at Wake Forest as a defensive assistant, where he helped the Demon Deacons reach a bowl game. By his own admission, stepping away from being head coach allowed him to refocus on some of the things he loved about coaching away from the responsibility of being a head guy. It was from that he was able to apply for Lehigh’s head coaching vacancy, refreshed and ready to jump right back into the Patriot League. 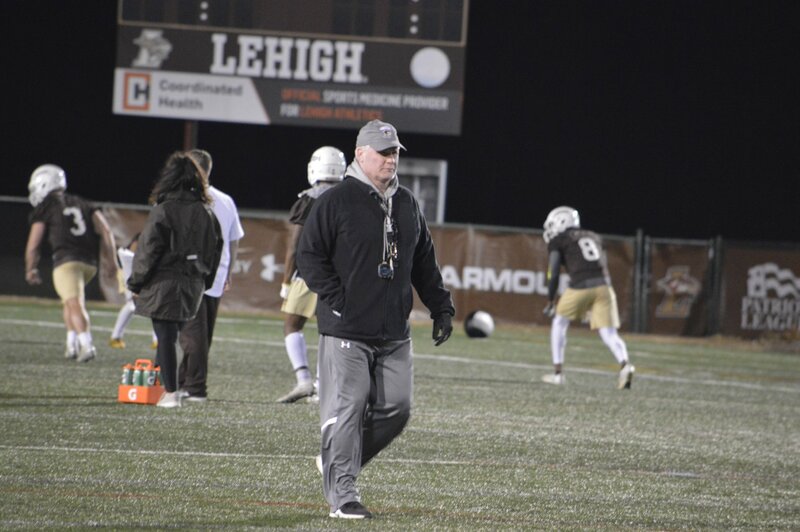 As this Lehigh spring football season nears its final week, Gilmore exudes a feeling of organization over what could have been a chaotic process. Changing head coaches is never a completely smooth process, but Gilmore, who knows exactly what it takes to run a Patriot League program, jumped right in. That started by heading on the road for recruiting to add more recruits to the Lehigh incoming class, adding to the names from the early recruiting period back in December, when Coen was still the head coach. Overall, Lehigh secured one of the largest incoming classes in quite a while, with a significant number coming in the late signing period and beyond, adding about five names late in the process. Then there was the process of interviewing the existing coaching staff and filling out the rest of his coaching team. Gilmore retained one key member from the prior administration – offensive coordinator Scott Brisson – but managed to pull together a mostly new staff, with some names from his rolodex from his days at Holy Cross. One, running backs coach Anthony DiMichele, played under Gilmore. Just today, Gilmore put in place the final piece of his coaching staff, hiring WR coach Brandon Lemon, who was working as a graduate assistant at Notre Dame. Finally this spring was a welcome move away from personnel decisions and towards what Gilmore loves more than anything – getting out on the football field to establish what he has in terms of returning players. Part of that process is laying out his vision for the Mountain Hawk football program. With Brisson returning as well as defensive coordinator Mike Kashurba, who was on Andy Coen’s staff last year and who worked with Gilmore in the past, there is some carryover from last year. One thing’s for sure – the attitude and effort are something that comes from the top down. From his experiences since leaving Holy Cross, his effort and energy are something that are amply evident at Lehigh this spring season. “We will not be outworked but we will have a lot of fun at the same time,” Gilmore told me. That seems to work as a mission statement for Lehigh football.